How should youth employment programmes in low-income countries be designed? The particular challenge for youth in Low Income Countries (LICs): “Youth growing up in low-income countries are at a disadvantage in transitioning to adulthood: although educational attainment is rising, the quality of that education is often weak and is not usually designed to build the socio-emotional and problem-solving skills that help youth navigate a changing economic landscape. Increased educational enrolment has generated greater aspirations for wage employment, but owing to their nascent structural transformation, the economies of most low-income countries are structured around household farms and businesses which offer limited opportunities for wage employ-ment.”The opportunities for youth are a function of the overall set of employment opportunities in a country; interventions that prepare youth for waged employment may not, therefore, have much success in solving the youth employment challenge. 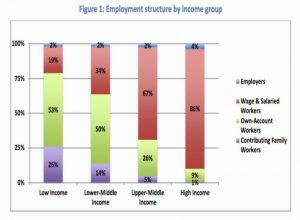 This chart illustrates that challenge in low-income countries (LICs): owing to a shortage of firms, only 19% of youth can expect to enter a wage jobs, while in high income countries, 86% can look forward to waged jobs. That 19% figure is likely to rise a few points during their lifetimes but not fast enough to absorb the million or so young people who come in to the labour market every month in Sub-Saharan Africa. So, training youth for jobs that don’t exist is a waste of their time and government money. Time-lag between Economic Transformation and Employment Transformation: As a country gets richer, the share of the labour force working in the informal economy or Household Enterprises (HEs) and on farms declines and the number of jobs in the formal enterprise sector rise. But Fox marshals evidence to show that even if an LIC achieves 5% pa growth, it will take them 332 years to achieve the same level of formal sector employment as an Upper Middle Income country. A modest rise of 10% in formal sector employment would take 111 years to achieve. Such projections should convince policy-makers and donors working in LICs to focus on interventions that help the informal, household farms and business sector. For, in the short and medium term, it is higher productivity and higher incomes in these sectors that will reduce poverty. They usually don’t measure broader aspects of employment or youth development, despite their importance to youth and society. Displacement: Fox brilliantly elaborates the problem of “displacement.” Many job creation and training interventions simply ‘displace’ an older worker from an existing job and replace him/her with a younger worker. She finds that, in the evaluations or the planning, many interventions do not factor in displacement in spite of the fact that many interventions do not increase total employment, they just change who does the job. She argues that displacement effects are important in estimating the true impact and cost-benefit of an employment program. They are rarely considered perhaps because, if they were, many programmes would be revealed to be a waste of money. Supply-side Interventions – are mostly about training: training in vocational and technical skills, business, life, employability and non-cognitive skills, counselling and mentoring services for either self- or waged employment, transport subsidies to help youth search for jobs, skills matching etc. Demand-side Interventions– are designed to improve factors outside the control of the labour force participants. They help firms expand or new firms to enter. For example, easing access to finance, reducing taxation, management training, mentoring, and incubation services to raise the profitability of firms, have been shown to help firms to expand and hire more employees. For the self-employed, business climate interventions such as construction of markets or roads, or financial inclusion reforms, may benefit actual, or potential, self-employed business owners by increasing their choice of activity, earnings potential, and decreasing risks. The choice of demand-side intervention should be guided by a carefully worked-out theory of change for each country, and each rural and urban area. “Does Gender Matter?” Of course. Women’s aspirations, and the socio-emotional skills to act upon them, are formed early in life. In the short-to-medium-term, female beneficiaries respond more positively to training interventions than their male counterparts. A recent impact evaluation carefully disaggregated results by gender in an intervention in the Dominican Republic (Acevedo et al., 2017). The evaluation found improved earnings and employment effects on women in the treatment group, but these evaporated after three years when the control group caught up. However, females in the treatment group gained in wealth relative to the control group, indicating that the short-run employment effect led to long-term economic well-being. The surveys detected no positive employment or earnings effects for males in either treatment group. Neither did the males in the survey show an improvement in soft skills as a result of treatment, where the females did in both the 1-year and 3-year surveys. With gains to employment disappearing in the follow up, the assumption that training is the preferred intervention for women is not supported by the evidence, even if training accelerates women’s entry into employment (in some cases). What do we know about Programmes that help youth enter Self Employment? “Household farms, small firms and self-employment will, over the next decade at least, provide the majority of new jobs in Africa – with many entering through informal apprenticeships arranged privately with family, friends or neighbours. Informal apprenticeships are not ideal job creators, first because apprentices need capital to go independent and if they cannot find it, they work longer for their trainer at lower wages. Second, apprenticeships perpetuate gender segregation with males working in carpentry, metal-working etc. where they earn a whole lot more than females working in tailoring, hair dressing etc.” Fox finds evidence that, though some training for self-employment works, the surprising result is that cash may work just as well. Youth complain that the start-up capital constraint is the biggest obstacle to starting a self-employment business. By far the simplest approach to alleviating this is through grant or loan finance: an evaluation of six microfinance programmes rolled out in areas where microfinance was previously unavailable showed that, while they had no effect on the earnings of existing business, they did help people start business. Basic Skills: Mastery of basic cognitive skills (literacy, numeracy) is a prerequisite to mastering business or vocational skills. The poor quality of education in many LICs and LMICs is one reason why business skills training programmes are often found to be ineffective. Who should implement employment programmes? Two reviews have found that programmes implemented by public sector agencies show less success than those implemented by NGOs. NGOs, however, may lack the administrative capacity and financial resources to bring their programmes to scale. Public sector agencies tend to have both capabilities, but not the performance, focus or dedication to the task found in NGOs. To bridge this gap, Nepal developed a hybrid option, the Employment Fund– a semi-autonomous agency which contracts private training operators to train youth who are under- or unemployed. Contracts are performance-based so if the participants do not get a job or start a business, the contractor does not get full payment. The programme has been successful at a very reasonable cost. School-based interventions: there is evidence that these help: two programmes in Uganda, Empowerment and Livelihood for Adolescentsand EDUCATE!,bolstered character skills and offered career guidance on labour market opportunities in secondary schools or as after-school programmes. These have been proven to accelerate youth’s transition into the household production sector at very low cost. 2) encouraging new firms to enter into operation. Programmes to help youth more rapidly enter and make money in the household production sector (farm and non-farm). Of these, easing access to finance combined with brief practical business start-up training, as well as programmes to develop negotiation, communication, client service, and other soft skills, seem to hold the most promise as a cost-effective approach. Skills training and Technical and Vocational Training programmes need to be used sparingly, if at all, with a clear eye on cost-effectiveness and the issue of displacement.